I live in what we call the Middle Kingdom (The Central Coast of California). The weather is near perfect and everyone has a smile. Our city was even voted "Happiest City in America." 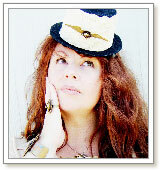 I've been told I design "Soft Steampunk" which is Steampunk style with a heavy feminine Victorian influence. I also have an industrial, more masculine Steampunk line and a very dark gothic line called "Sightmares" evil eyes. Other artists. I see what others are doing and then try to do something completely different. The most often comment at fairs and shows that I hear is, "I have never seen anything like this in my life." Those are the comments I love hearing most of all. Brass, copper, glass, leather, Ice Resin and Kato Art Clay. Brass handles on an antique trunk. It told me what it wanted to be as I worked with it. I am thrilled with the final piece and it's one of my all time favorites. 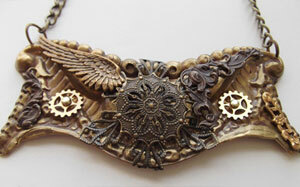 I started designing Steampunk jewelry way back before it was called Steampunk, in 1988. It started with a box of old pocket watches that I purchased from a watchmaker who was retiring. There was something about the watch hands, gears and empty cases that intrigued me. Of course people thought my art very strange and either loved it or just shook their heads. I am so happy to see the Steampunk Genre be so widely loved and accepted. It was a long wait. I have been a maker (steampunk term) and artist for over 25 years. Fire Mountain was recommended by a friend who beads. I was so thrilled to find you. I restore antiques, am a regular character as Dr Brassy Steamington at Renaissance fairs, Steampunk Conventions and masked balls. My next event is the MYTH Masque Ball at the Vibiana in Hollywood on June 9th, 2012. I will be a vendor and I can't wait. I have not had TV for over 9 years, which leaves lots of time for other endeavors. My art is a full-time career. I often start my day at 7AM and I don't leave the studio 'til well after dinner time. I work 7 days a week currently and I love every moment. Being an artist flows over to every other part of my life. I am active in donating my jewelry to local charity auctions and I am often stopped while out shopping if I am wearing one of my pieces. I have an Etsy shop at http://www.etsy.com/shop/DrBrassysSteampunk. 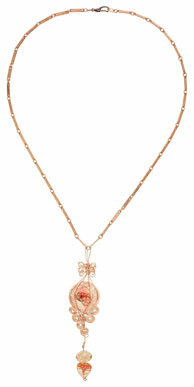 My jewelry has been showcased at local boutiques and at the Museum of Monterey Gift shop. I also do as many art shows and fairs as I can, but really Etsy is my main focus. I do. Whether it is to raise money for our military families, to aid our local humane society or to assist with children's charities. I feel it is my privilege and honor to be a donor. Don't be a one trick pony. If you are doing exactly what you were doing 5 years ago, that is bad sign. Challenge yourself. Branch out into mediums that you are unfamiliar with. It will flow over into your main art. Most importantly support other artists. View all of Kimberlee's designs in the Gallery of Designs.